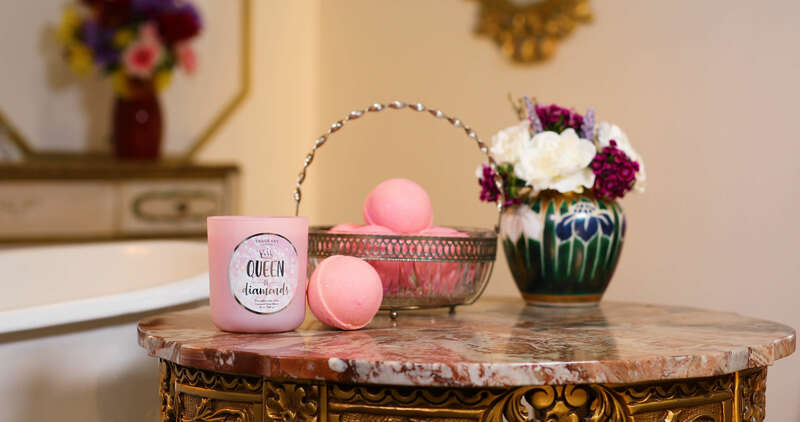 Move over Queen of Hearts, the Queen of Diamonds has arrived with Fragrant Jewels’ Candle and Bath Bomb Set. Embrace the Queen you are with the wondrous smell of a flower garden in the comfort of your own castle. Every inhale transports you to your own royal retreat as soft apricot tulips, mandarin blossoms, and exotic Indian plum pair with fresh nectarine leaf, water lily, and musk. If the crown fits, own it! Collect all 10 crown-inspired rings with our latest Queen of Diamonds collection. Each bath bomb and candle will reveal our rare, glittering crown-inspired rings in styles fit for the queen in you as well as a code with the chance to win a ring worth up to $10,000 through our Enter the Vault Sweepstakes! Everyone around you is sure to bow down and make way! Free Bonus Each Candle contains a beautiful crown-inspired ring! And a code that gives you a chance to win a ring with a retail value between $100 and $10,000! Free Bonus Each Bath Bomb contains a beautiful crown-inspired ring! And a code that gives you a chance to win a ring with a retail value between $100 and $10,000!